Written by Jaxon S on Monday, April 28th, 2008 in Borneo Tourism, Borneo Travel. Read the exciting story and enjoy his crisp writing as well in the article titled “Hanging out in Borneo on a family vacation“. Written by Jaxon S on Sunday, April 27th, 2008 in Borneo Flora and Fauna. 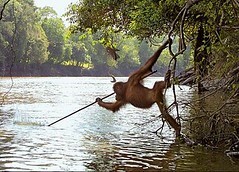 A male orang utan was captured on camera trying to spear a fish. The scene was captured on an island called Kaja, off central Kalimantan, the Indonesian part of Borneo. Kaja Island, located about 40km from central Kalimantan capital of Palangka Raya, also has facilities to rehabilitate the orang utan. The image is part of several images in a new book titled “Thinkers Of The Jungle” by Gerd Schuster, Willie Smits and Jay Ullal, published this month by Ullmann Publishing. “We all recognize these highly intelligent and impressive animals - orangutans. But very few people know anything about their habits and how they live. Around 6,000 of these animals die every year; they are among the world’s most endangered species. 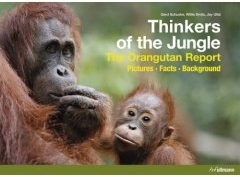 This book reveals the truth abouth the tragedy besetting the jungles of Borneo and Sumatra. By the way, have you ever tried to catch a fish using a spear? I had. In my case, it was not a spear but rather a sharpened bamboo pole. But that was when I was small in the 80’s. I remember catching a small stingray at the Bak Bak Beach in Kudat, Sabah — the northern Borneoan state of Malaysia — using a tiny bamboo pole. Unlike other type of fish, stingrays are easy to strike, especially baby stingrays. They would just glide in shallow water and hide under the sand. All you need to do is to thrust the spear at the right spot and you’d catch yourself a baby stingray. Written by Jaxon S on Friday, April 25th, 2008 in Borneo Flora and Fauna. Remote camera planted in Bintulu, Sarawak in Borneo have captured the picture of two Malayan sun bears, the first such discovery in Malaysia. Two brown Malayan sun bears caught on a remote camera in a planted forest zone in Bintulu Division are believed to be the first such discovery in Malaysia and Borneo. 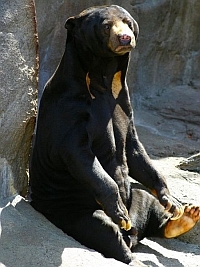 Sun bears found in Malaysia and Borneo were black in colour, said Grand Perfect Sdn Bhd conservation department’s project officer Belden Giman. Written by Jaxon S on Friday, April 25th, 2008 in Borneo Environment. Greenpeace has released a report titled “Burning Up Borneo” where it mentions Unilever as one of the companies contributing to the destruction of the “last remaining habitats of the orang-utan and other wildlife”. The report focus on oil palm plantation in Kalimantan, Indonesia. I shouldn’t be too concerned because that the destruction is not happening in my homestate, Sabah, the Malaysian state on northern Borneo. But Borneo Island, the once majestic island, is ailing and each day its natural forests are being destroyed to make way for man-made forest comprising thousands of hectares of oil palm. Written by Jaxon S on Tuesday, April 22nd, 2008 in Borneo Tourism. Prince Albert II of Monaco, who is on a three-day visit to Sarawak, the other Malaysian state on Borneo Island, today launched the world’s first digital remote-controlled bats monitoring system at Deer Cave, one of the many caves within the Mulu national park. Written by Jaxon S on Sunday, April 20th, 2008 in Borneo Development Issues. Malaysia has approved a massive RM4bil (about US$1.27bil) to increase rice production in the country and keep price down. Under the new initiative, launched amid rice price increase decreasing supplies, Sarawak, the Malaysian Borneo state would be turned into the new rice bowl for Malaysia. Written by Jaxon S on Friday, April 18th, 2008 in Borneo Literature. I came across Borneo Expat Writer run by Sarawak-based American writer Robert Raymer while blog-and-site-hopping on Yahoo and Google using the keyword “Borneo Blog”. Raymer, an American expat, teaches creative writing at the Universiti Malaysia Sarawak. Borneo Blog Discovery: Dr Mahathir Mohamad, Malaysia’s 4th PM, Blogs! Written by Jaxon S on Thursday, April 17th, 2008 in Borneo Environment, Borneo Flora and Fauna. The Borneo pygmy elephant — long thought to be native of Borneo, the third largest island in the world — may not be endemic to the island afterall. According to a new publication, the small-size elephant which is found only in Borneo — in particular Sabah, the Malaysian state on north Borneo — could be the last survivor of the Javan elephant race which is already extinct from its original habitat on the Indonesian island of Java. And the Sultan of Sulu — not the current one, but his forefather several centuries ago — might have played a role in bringing the elephant to his once sprawling Sulu sultanate. WWF quoted Shim Phyau Soon, a retired Malaysian forester, as saying that the Sultan of Sulu might have brought the elephants as gifts between rulers. Written by Jaxon S on Sunday, April 13th, 2008 in Borneo Flora and Fauna. A frog without lungs, found in 2007 in an undisclosed location on Borneo Island, is making waves around the world since the past few two weeks. This frog practically jumps around the Internet, leaving a trail of oohs and aahs. Written by Jaxon S on Sunday, April 13th, 2008 in Borneo Wildlife. As if the plundering of tropical forest for its precious timber is not enough already to spoil the pristine Borneo jungle! Rich businessmen or towkays in Sarawak, the biggest Malaysian state on Borneo Island, are paying good money to native trappers to trap endangered and exotic animals to be displayed in their homes — of all things — as status symbols. The Star newspaper reported that the activity had also spawned black market for endangered animal in certain part of of the state.